Audiobooks are increasingly popular in the modern busy times. It helps to acquire knowledge quickly when we don't have time to read books. That is why many tech giants like Audible, Apple iTunes, Kobo, Google and so on have jumped into the industry. Among them, Google Play audiobook is less well-known and it was released for only a few months. But it has some advantages compared to Audible such as you don't need Google Play Audiobooks subscription to buy books and they are DRM free. It is now available in over 45 countries and 9 language. If you are new to audiobooks, it is a good idea to start your audiobook journey from Google Play. Google wants to keep things simple. The new audiobook subsection is added under the Google books category directly. 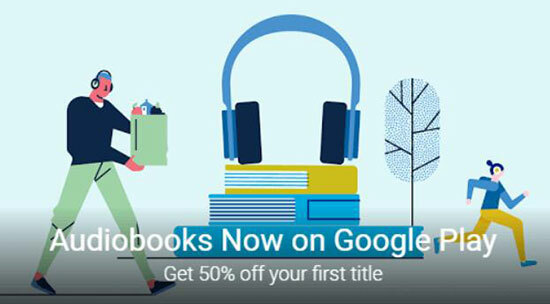 If you have bought books from Google Play, you should have already knew how to buy Google audiobooks as well. 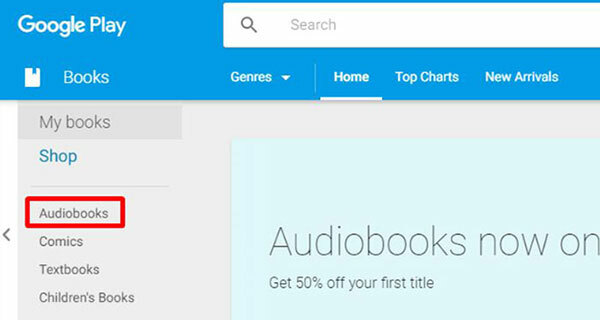 According to Google, all the audiobooks are available at an affordable price. Together with the advantage "Listen without a subscription", you don't have to invest a lot to try it out. Step 1. Open the Google Play Books app from your Android mobile phones or tablets. Step 2. You can go to the audiobooks tab to find the audiobook you want from the curated list such as "Top selling audiobooks" or you can search it directly. Step 3. After locating the book, you can click the album cover to learn more details about it. Step 4. If you are satisfied with the audiobook, you can click "Buy" simply. For a first time user, it may prompt you to input your payment info etc. If you are using an iPhone, iPad, iPod or computers, you can't	purchase	audiobooks	from the Google Books app. Please turn to the Google Play Books page online. Step 1. Visit the Google Play Books online. Step 2. 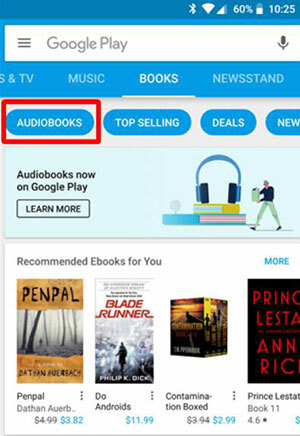 Browse or search to locate the audiobook you want. Step 3. Click the cover of the audiobook to open the details page. Step 4. From there, you can learn more about the audiobook and click "Buy" to purchase the audiobook. One of the great features of Google Play Audiobook is that it will automatically save your playback progress and pick up where you left off when you listen to it next time from any devices. Such as Android, iOS, Web, Google Home. And it also has the feature to help you add/remove a bookmark. 1. Open the Google Play Books App. 2. Tap "Library" > Tap "Audiobooks". 3. 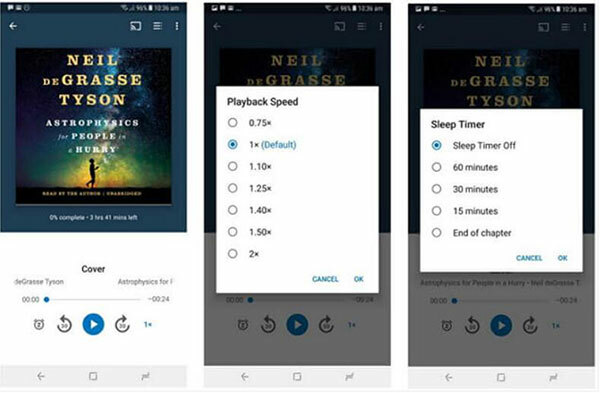 Tap the audiobook you want to listen to, it will be downloaded and played. Note: To avoid cellular data charges, we'd suggest you to download audiobooks with Wifi only. You can click "Settings" > "Download Over Wifi only". 4. On the app, you can adjust the playaback speed, set a sleep timer and so on. If you'd like to enjoy audiobooks from Google Play on your computers, you can use the browsers such as Chrome, Firefox, Safari. 1. Open Google Play books page and login with your account and password. 3. Find the title of the audiobook you want and click "Play". Another reason why I'd recommend Google Play audiobooks is the integration with Google Assistant. You can easily to ask Google Assistant to play any book for you without evening touching your hands just by saying "OK, Google, read my book". If you want to set a timer sleeper, you and also say "OK, Google, stop playing in 30 minutes". Want to enjoy audiobooks from any devices offline? No problem. Google Play audiobooks have no DRM protection and they are in a common M4A format. 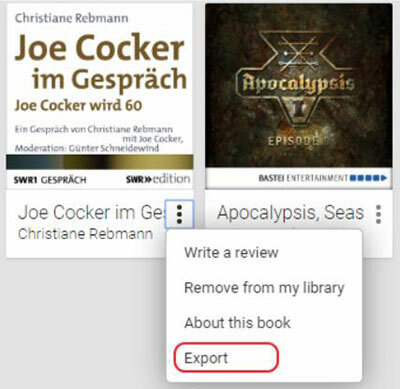 When Google audiobooks first debut, there is no direct "Download" button. Fortunately that Google add it after a few months now. Step 1. Log in Google Books page . Step 2. Click "Books" > "Audiobooks" to locate the book you want. Step 3. Click the three-dot icon beside it and then choose "Export" to get the M4A audiobook. This is Fantastic compared to Audible of which all the audiobooks are in AA/AAX formats with DRM protection. So are you considering to switch to Google Play? For your convenience, to solve the issue, you can also use DRM Audible Converter for Mac to help you unlock DRM from Audible too. Let's know if you have any questions or suggestions.